Join the discussion on our forums! 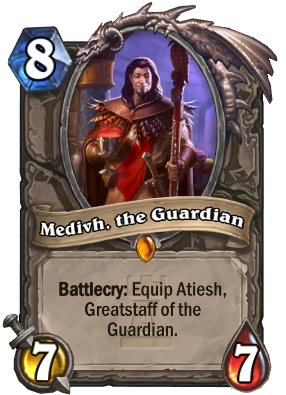 Come discuss Medivh, the Guardian over in our dedicated Medivh, the Guardian discussion topic. 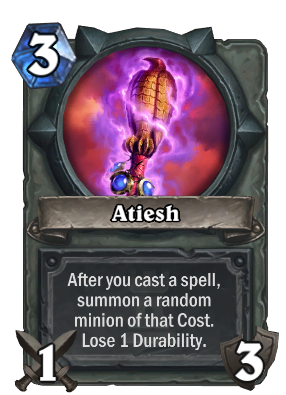 Battlecry: Equip Atiesh, Greatstaff of the Guardian. If you think the party's great now, just wait 'til he invites the orcs over! I wouldn't worry about it too much as he'll rotate out next expansion. The end is in sight. At the start of Un’Goro I disenchanted him and Barnes to craft my Elemental Shaman deck...oops. Anyone know if the hero/death knight cards will trigger the weapon? Death knights cards aren't spells. Then Medivh uses Echo of Medivh on Medivh, the Guardian so that Medivh can summon Medivh. This is a really fun card to play. So strong with Firelands Portal! What if you have the Medivh hero and then play this card... Is he his own minion? Awesome card with gorgeous effects and voice lines. Maybe not the most competitive, but I LOVE playing it. I think this card is extremly underated card. Sure, it wont help you against aggro, but you have enouth cards against agro. this card helps alot against controll. Turn 8 Medivh, the Guardian into turn 9 Twisting Nether spawning Kel'Thuzad.